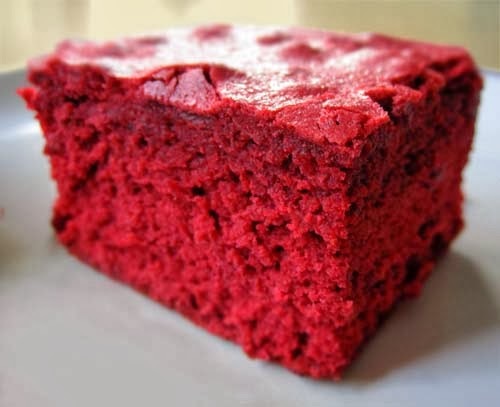 The recipe for this scrumptious red velvet brownie is adapted from How Sweet It Is. Changes are these: (1) No frosting was used, and (2) no chocolate chips were used. In the bowl of an electric mixer (e.g. Hamilton 6 Speed Classic), cream butter and sugar until fluffy. Add eggs one at a time, then add remaining teaspoon of vanilla. With the mixer on medium speed, add in cocoa powder mixture. Beat until batter is completely red. (If at this time your batter is NOT red, you can add a little more food coloring if desired. Color will depend on brand.) Add flour and salt, mixing until just combined. Fold in chocolate chips.